Magnificent gated estate on 1.072 acres in Grogans Point overlooking the 13th hole of The Oaks Golf Course! 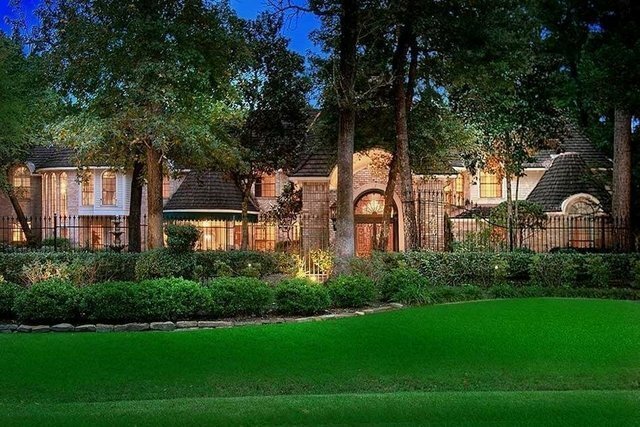 Circular drive leads to portico entry; Stunning antique wood floors from The Bank of Houston, soaring ceilings, exquisite custom trim work and abundant windows provide gorgeous views throughout. Four fireplaces; grand formal living room with wall of windows and elegant formal dining; handsome study with exceptional Enkeboll trim; cozy tea room in the front of the home encased in windows; Designer kitchen with double island, professional Viking appliances & wine cellar overlooks breakfast room & den; huge master retreat down with sitting area and palatial master bath; state-of-the-art sound proof media room like youve never seen before; game room w/bar & balcony, 49x35 exercise gym w/Turflex flooring & 4 spacious bedrooms up; 6 car garage plus 2 car porte-cochere; amazing yard with covered patio, extensive landscaping, waterfall and serene river surrounds fabulous pool!